Apartments in Farmhouse in Maremma countryside halfway between Montalcino and the Sea. The cottage is located on an estate of 130 hectares of land. In recent years, the owners are dedicated to the production of wines, now reaching about 15 hectares of vineyards. The estate produces quality wines, in the last years wine production and has won many prestigious awards. The farm consists of 10 apartments from 2 to 6 beds, all apartments have a kitchenette. The farmhouse is renovated from an old farmhouse in 1700, in a swimming pool and a small restaurant for guests of the apartments. In summer, dinner is served on a terrace overlooking the vineyards. Guests can take advantage of the B & B with views of the garden. By the pool there are sun loungers and deck chairs to enjoy the relaxation of the Tuscan countryside. 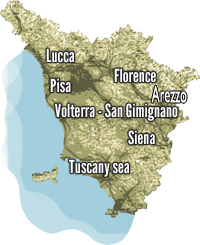 Less than 1 hour by car can reach Montalcino, Siena, Grosseto, Follonica, Rome is about 2 and a half hours by car. Pitigliano, Massa Marittima can be reached along the wine route through the countryside. At about 9 km from the farm are Roccastrada and other typical Tuscan village with all kind of services. GR1116-7 (4p) SECOND FLOOR 75sqm double room, double room, bathroom with shower, a living room with kitchenette. GR1116-8 (4p) SECOND FLOOR 90sqm double room, double room, bathroom with shower, a living room with kitchenette, storage room. GR1116-9 (4P+2) FIRST FLOOR 106mq . Double room, double room, 2 bathrooms with shower, living room with kitchenette, fireplace and double sofa bed. Small terrace, veranda with table and chairs. total price includes: bed linen and towels, utilities (water, electricity, gas, heating), final cleaning, swimming pool, mountain bikes, ping-pong.